You spent hours sweating over a blog post to make it as appealing and complete as possible. You spent weeks of intensive preparation to produce an eye-catching video. You finally have your content in shape and publish the end result. You promote it with a few tweets and updates on Facebook and LinkedIn. And then? Don’t just cross your fingers and hope for the best. 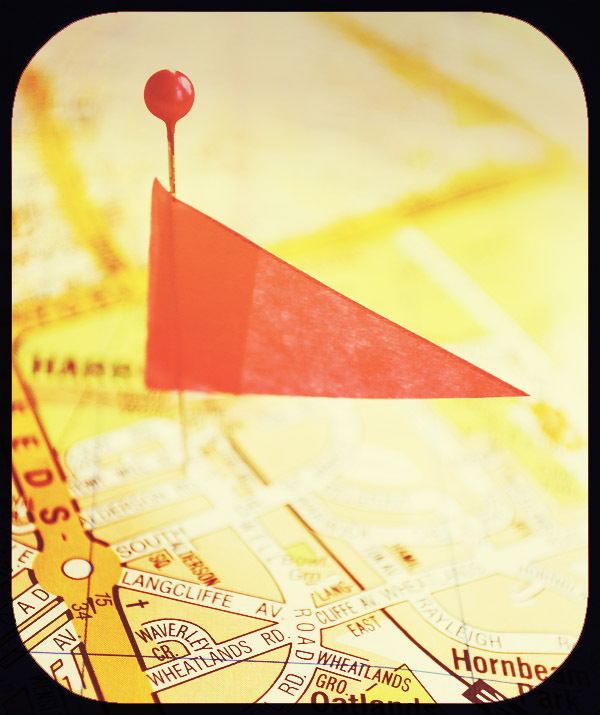 Turn to mapping to ensure your content reaches your target audience and makes the biggest impact possible. Consider this example: Rabobank publishes a Dutch magazine, Dichterbij, for its customers. An editorial team selects the topics, interviews the sources, takes the photos, writes the articles, and edits and designs the magazine. After a few weeks of work, the magazine is published and mailed, and that’s the end of it — but it doesn’t have to be. What if Rabobank took its content and did more. What if it mapped its content? Consider a single article in Dichterbij — the interview could be captured on video or the unused quotes shared on different platforms. The images could be paired with a quote to post on another platform. Plotting your content map enables you to think ahead about the possible extras that could result in additional content without spending too much time. Content marketers more frequently use the term “content mapping” to refer to the concept of mapping content creation to the needs of your users or the goals of your organization. In this case, though, I use the term to talk about mapping content to other content, which is done for content curation purposes. Content mapping for curation purposes is a logical derivative of the phenomenon of mind mapping — a diagram is drawn to visually organize information, frequently around a single concept represented as a circle in the center of the map. An experienced content mapper can easily chop the topic into separate thoughts or ideas. But less-experienced content mappers can brainstorm, using the map as a physical manifestation — drawing a tree, for example, and jotting down in the branches all the different subjects that come to mind. Follow the mind-mapping process with these steps, and see how to do it with the topic of content mapping in each how-to example. 1. Select your topic. What subject do you want to gain people’s attention? You don’t need to start from scratch. Have you posted an interesting article on your blog recently? Does your magazine contain an article about which you would like to focus more attention? The subject also could come from a new content vehicle — a publication, a film, etc. Specify the source of the topic’s content. Where does it link to your messages? Will you link to the main topic’s primary content on a page on your website? What about as a video on YouTube? This content’s home becomes the source file to which you will link in as many posts as you can. But always remember the golden rule: It has to be relevant. How-to Step 1: My main topic is content mapping. The primary content source is this article posted on ContentMarketingInstitute.com/blog. 2. Divide into five subtopics. Think about how relevant your subtopics are, but bear in mind that these subtopic posts may not be in a ready-to-share format. 3. Create four perspectives for each subtopic. Think, too, about the way to convey each perspective’s message. Will it work best as an interesting headline or a quote, or should it be an infographic or a photo collage? Or how about a snappy quote on video? In this step, you create 20 linking messages for the primary topic to draw in your audience. You also can use these later to create additional updates or content. 4. Specify the content types and channels. Of course, you won’t be able to create all your perspectives for the same channel. Think about how you want to distribute your messages. Take into account the specific characteristics of the network or medium you choose. For example, don’t place too much text on Facebook. And while your tone of voice on Facebook will often be informal, LinkedIn users expect a more formal language. Post the title and a link to the complete article on Twitter. Write a 400-word summary and post to the company’s website. Record a short explanatory film such as, “Content Mapping Explained in 60 Seconds,” and publish video to YouTube, Facebook, and Twitter. Write a clear and simple list of five steps for creating a content map and publish that text on LinkedIn. Create an infographic on five steps for creating a content map and publish it via Facebook and Pinterest. Use a quote from a client (Judith) and her content tree, now tagged as “Judith’s tree.” Include a photo of Judith, a quote, and the logo for her company to share on Facebook and Twitter. 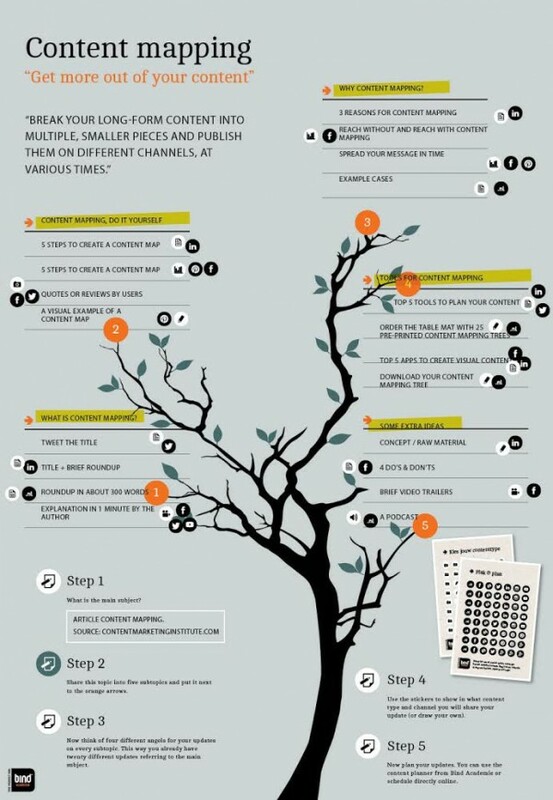 Develop an example map — an illustration of the content tree included in the original article — and publish it on Pinterest. Write three reasons for content mapping to be used as a short text update for LinkedIn and include the link to the original article. Create an infographic that compares the reach achieved without using content mapping to the reach achieved with content mapping and post to Facebook. Design a cartoon that illustrates the role of timing and platforms in content mapping (for example, a cartoon on how your Twitter followers likely won’t see your tweet because they aren’t looking all day long). Publish the cartoon on Twitter, Facebook, and maybe Pinterest. Publish a number of case studies showing the value of content mapping on the website. Write an overview on the top five tools for monitoring when your followers are online. Publish as an update on LinkedIn and a link to the update on Twitter. Create a table mat with 25 pre-printed content trees and include a link to the original article and a link to an online print store so viewers can order copies. Identify the top 5 apps to create visual content. For most updates you will need visual content. Share a list of apps to create films or images very easily. Share how to secure a blank content-mapping tree. Give users the option to print through an online store or download a PDF. Develop the do’s and don’ts of content mapping, such as “stay on topic” and “don’t repeat yourself.” Create a graphic representation that can be posted on LinkedIn and Twitter. Draft a text update with four practical tips for dividing your content into chunks. Create a trailer — a short promotional video to promote the article. Make an audio clip where the article is read out loud and publish on your website and via a link on the original content site. 5. Schedule your posts over a longer period. Now that you’re ready to schedule your posts, decide on what period you want to focus attention on your topic and schedule updates accordingly. Vary the times of day at which you post. This way you’ll get the most viewers (unless your aim is a small audience and you’ve decided you want to repeat your message). Content mapping takes time. The aim is not to create content for the sake of creating content. Your content has to be top quality if you want to achieve your goal. It doesn’t matter how many posts you churn out. If they are not relevant or interesting, every minute spent on them will have been a waste of time. I sometimes get asked whether readers are overwhelmed with all this content. And I’ll admit if you look at all the different types together it can seem that way. That’s why it’s so important to create a content map to manage the process of publishing the posts carefully, both across the various channels and over time. This article was adapted from its original Dutch publication. For more great ideas, insights, and examples for advancing your content marketing, read Epic Content Marketing, by Joe Pulizzi. Carlijn Postma is a Dutch author, speaker and content marketing strategist. In 2010 she published her first book about Twitter, a bestseller in The Netherlands. Last June her latest book was launched: Content Marketing in 60 minutes, an inspiring and practical book. Carlijn is also founder of The Post, an agency for content marketing, and owner of Bind Academy.